We did it! We got mosquito repellent! Jake chose the battery operated repellent. Skeptical me chose the old-fashioned Off!. 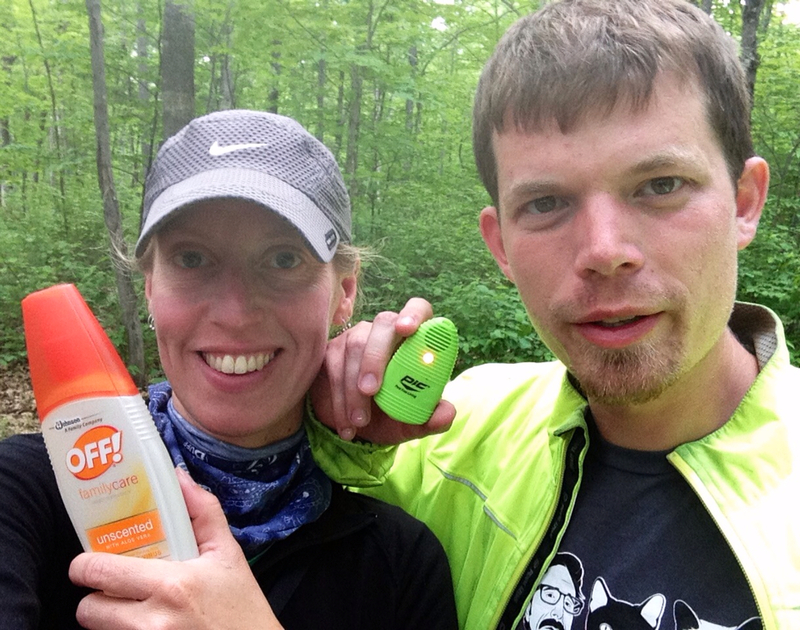 We tested our products shortly after arriving into camp. About five minutes after testing the electronic repellent, Jake applied the Off! and then announced, "It works like a charm." 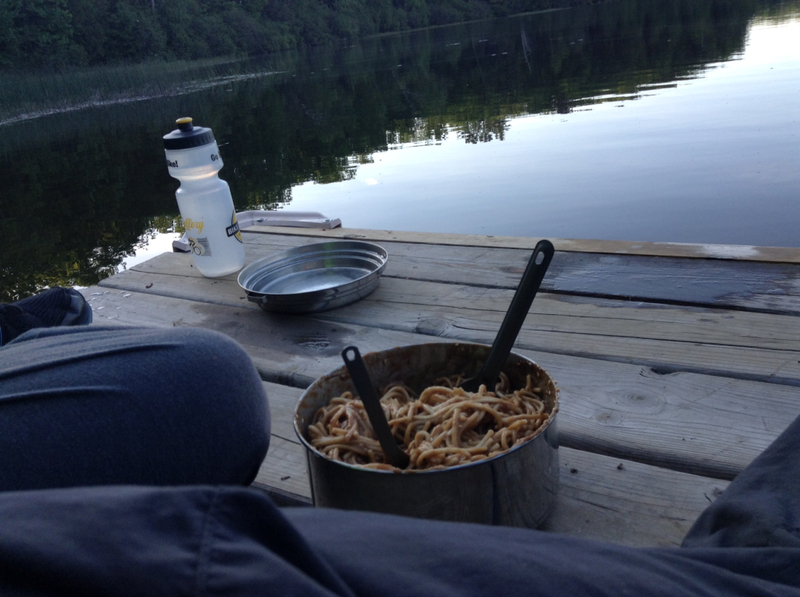 The repellent successfully got us through our tasty toasted sesame garlic noodles, which we enjoyed on the dock of Big Lake. The repellent, however, did not get us through the return-to-camp-get-ready-for-bed-preparations. Either the repellent has a quick life, or the mosquito intensity ratchets up considerably just after dinner time. Our tasty Thai dinner, enjoyed lakeside. We ran into three bike tourists today. These were the first riders we've seen since leaving St. Paul. The first rider had a Canadian flag attached to his bike. Although we slowed down to talk with him, he made no attempt to be friendly. He just kept pedaling. The second and third riders were a couple from Switzerland. They are riding across the country. It was neat talking with them, especially since my mom and I did a bike ride through Switzerland about five years ago. We both agreed that today has been the most enjoyable day of riding in Wisconsin. We attributed this to the lack of headwind that we've had to pedal against the last few days. Towards the end of the day, it also seemed as though someone ran a hot iron over the route, flattening many of the hills that we've been riding since we entered Wisconsin. My favorite Wisconsin road, thus far, is the 14 mile-long County Road FF leading into Mercer. It was scenic, dotted with wildflowers, windy, and just enough downhill to get us to the top of the next uphill. I've been to Mercer before. My dad's Aunt Mary (who passed away a few years back) used to live in Mercer, in a big ol' house on Spider Lake. I remember a few things about her: her house was decorated with a bunch of antlers and dead stuffed animals, she used to can tons of food, and there were gun holes in the walls from when Al Capone used to stay at the house. Jake and I spent a few hours in Mercer. We took advantage of the wifi at the Mercer Library, and we stocked up on groceries for the next few days. We were impressed by the selection at the tiny grocery store; they had a few Thai options! 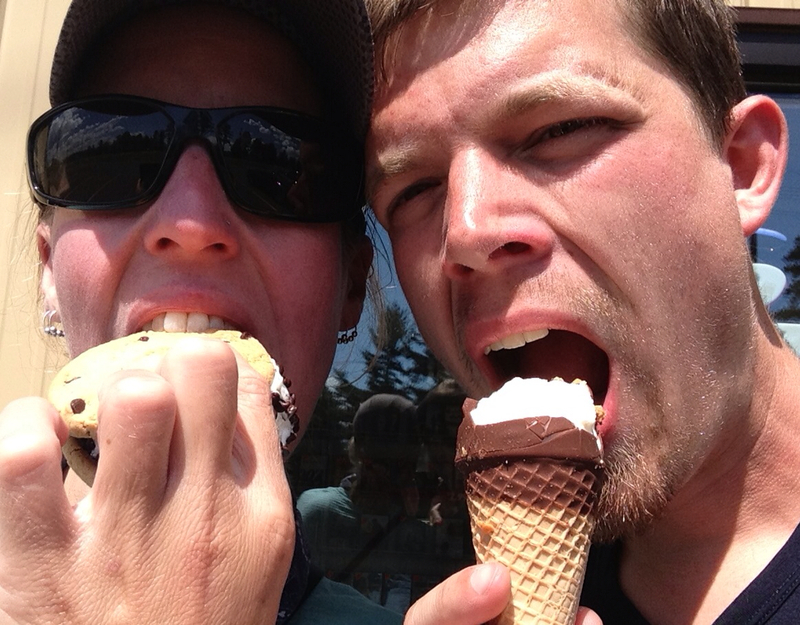 Enjoying ice cream in Mercer. And...they had candy corn! It wasn't just any candy corn. No, it was Brach's candy corn! Can you believe it? In a small grocery store, in a small town, whose population is a mere 1,732. Ms. Brach used to live in the same northern suburb of Chicago where I grew up. She disappeared a number of years ago, and her body was never discovered. It is believed that her butler (who apparently was an heir to her estate) chopped her body up in the meat grinder and fed her to her dogs. Think of that every time you enjoy Brach candies! I certainly will, as I treat myself to a piece of corn every few miles. Hey Sarah! The name "Teale" doesn't ring a bell. It's a small world out there, though, so I wouldn't be surprised if they knew each other. So nice to meet you! Hope all is well!